Instead of lathing, the Hard Series are treated with sandpaper cleaning right after hammering, resulting in an earthy look. 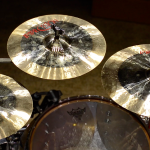 The brighter, high pitched tones and shorter sustain make these cymbals ideal for high volume situations in rock and metal where multiple loud instruments fight for their air space. In medium weight ranges the dirty hi-hats provide controlled, yet full-bodied backbone to your beat.